Try this alternative to case briefing to save time and find important information quickly. You are going to read a lot of cases in law school. It is not uncommon for law students to receive hundreds of pages of reading per week. Law school case readings are completely different from anything you will have read before law school. You will need to comprehensively cover the cases and grasp the concepts in their entirety. Given the complexity of legal cases, this can become a long, time-consuming task. Streamlining and saving time is critical to success! That is why case briefing exists. In a nutshell, a case brief is nothing more than a set of notes you take on each assigned case to ensure you’re paying attention to the important points. Whether its typing or writing out your case brief, you want to get down the key information like the names of the parties, the court the opinion came from, the procedural history, the facts, the issues, the holding, and the black-letter law. 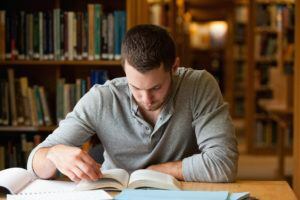 You do not necessarily need to write out a case brief for each and every case you read throughout your three years of law school, however it is a good idea to formally brief the first few cases you read in each class during your first year. This is recommended so you can get a feel for what you should be looking for in a case. Case briefing can help you get used to law school readings, including the important task of picking out the black letter law. These are principles of law that entire opinions are based on and, in many cases, that you will eventually need to know for the bar exam. When the time comes to outline, having briefed your cases can make things much easier. Although case briefing will save you time in the long run, properly briefing a case can take up a good part of your precious time! Much of your time will be spent simply retyping information found in the text. Once you factor in the time it takes to identify each case’s most important issues, briefing can easily take you six to ten hours or more to do. But Don’t Despair! There’s Book Briefing Too! Book briefing, made popular by Law School Confidential, accomplishes the same tasks as case briefing but in a more streamlined way. You still identify all the items listed above, but by highlighting them in the text itself rather than writing everything down. You can even draw a little picture at the top to remind you of the facts. If done correctly, you will be able to easily find key information based on a color-coded system. Check out this example of a book briefing. The key to an effective book briefing is using a consistent color scheme throughout your casebooks during the whole semester. You get used to associations such as “facts are always green” and, with enough practice, you will be able to identify the different sections at a glance. Practice is important to becoming diligent in your highlighting. It can be tempting to highlight the entire case but force yourself to only highlight the most important things. Replacing writing out full briefs for the quicker, more pragmatic book briefing saves you the time of recopying while keeping all the pertinent information easily accessible. This comes in handy, especially in classes that practice the Socratic method. A glance at the text rather than flipping through your brief will allow you to effectively answer nearly any question your professor throws at you. And when your professor is waiting, there isn’t a moment to lose. Book briefing may be the way to go if you are a visual learner. Using multi-colored highlighters when reading for class can help you organize and remember the material. When you go back to the material to review, it will be visually and colorfully organized, which will help you recall and remember the information. Think book briefing may be right for you? Try it out! What do you have to loose? You may find it very helpful for getting through complex case readings and outlining for exams. Most importantly, book briefing can save you time that you can use to learn the difficult legal concepts tested on exams!